Becky's Tote-ally Awesome Tote Tutorial is now available for purchase! 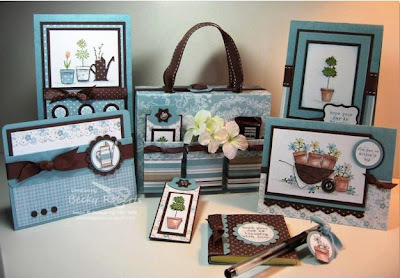 The tutorial contains 26 pages of step by step cutting instructions and color photos for completing the tote, 4 cards, Post It note pad, pen and bookmarks shown in the photo above. The tutorial will be e-mailed to you within 12 hours of ordering. If only ordering this tutorial, select the Buy Now button from the side bar. If ordering this tutorial with others, you can go to the 'order tutorials' page and use the Shopping Cart option. Remember that ordering through PayPal does not mean you have to have a PayPal account, you can use a regular credit or debit card there too. If you would like to send me a personal check, please e-mail me. Becky, I love this project. What are your policies for using this project and handouts for classes? Awesome project Becky! I have a question too! Are we permitted to make your "designs" and then sell the finished product (but not the instructions)? I just ordered my tutorial!!! Thanks so much for pricing your tutorials so very, very reasonably! I see others that cost way more for many fewer pages, photos, etc. and I don't buy those. Please continue to keep your prices so reasonable. Just brought your tutorial, can't wait to play lol! As soon as I saw this I knew I had to get the tutorial... thanks..
Hi Becky, You are just way to talented, which is a good thing. I love checking out your blog. Thanks for sharing your creativity with us! WOW, this is one awesome set!!! Love the color combo & everything about it. Great job. I love this. I just purchased the tutorial. I can't wait to get it. Thanks so much!! Great project, Becky. I sent my paypal to you earlier today. Looking forward to receiving the tutorial! Well, as soon as I purchased it, I ran downstairs to start collecting the necessary items. Oh drat, I can't find those adhesive velcro dots. Oh well, I'll deal with that later. I actually had pretty much everything you listed. Please check mine out. Of course, it looks pretty much like yours...what a coincidence. I am so thankful for this project. You are so generous to share your creations. I can't thank you enough. Check out my blog. Just bought it and can't wait to make one!! Thanks for making it so affordable!! Ok..I don't know what rock I have been living under but I just came out...OMG..what an amazing blog you have, where have you been hiding? I have added you to my reader and I will be back to buy some of the tutorials! Yay! Thanks for making this and sharing!! I just bought it and am waiting oh so impatiently by my email!! lol! Really, this is awesome and your prices are perfect, Thank You!!! Your projects are so beautiful -- clean and crisp - not over decorated... LOVE them! I have a wonderful demo here in Northern CA, you remind me of her - quality, consistency and talent. Thanks for letting me enjoy your blog. Thank you for sending the tutorial so promptly! I can't wait to try this - I am hoping for snow this weekend so I can play Saturday afternoon! Your ideas and color scheme are awesome! Just made one of these! So easy! Lots of fun! Thanks for the prompt email directions and for all the great pictures in the tutorial. I will purchase again! Hey Becky, I love this tote. I made mine already. You can view it on my blog. I love this project! Your directions were awesome. Thanks again!